More and more companies are seeing the value of Twitter for business purposes and jumping on board the social media platform. Those doing it well are seeing real results, but many businesses – both new and experienced tweeters – are guilty of crucial errors that serve to damage their brand more than promote it. By tweeting recklessly, their strategies are often ineffective and can even be annoying, and while there aren’t any legal ramifications for committing these crimes…there should be. Maximize your brand’s success by avoiding these five crimes on Twitter. The point of social media is to be social, if you’re not going to be social then why bother? Twitter is a great source for real-time news updates, so frequent and consistent updates are crucial as long as they’re not overbearing. Logging in every now and then to randomly tweet or retweet is a wasted effort on your part and is worthless to your followers (if they haven’t unfollowed at that point). In other words, if you’re not going to join the party, then please leave. The Perpetrator: Amazon swung and missed during the holiday season and only tweeted six times between December 13 and January 25. Ouch. The Resolution: Get that tweet count up. Post engaging and relevant content throughout the day and respond back to your mentions. This will give your followers a chance to interact, learn, and engage with your brand. Include Twitter in your company’s social media plan, or delete it. If social media is social, then follow social norms. We all have a friend that talks too much without ever saying anything of value. The point of tweeting is to deliver useful and engaging content to your consumers. Tweeting too much, or tweeting off-topic, will annoy your loyal followers. The Perpetrator: HBO has a great brand and their content has a strong following, but having great content doesn’t grant you immunity from overtweeting. On June 10th they tweeted a whopping 48 times and that’s just way too much. We like you, HBO, but we don’t like you that much. The Resolution: Find a balance and remember that it’s quality not quantity that matters most. Tweet enough to engage your followers, but don’t overburden them. Twitter can be a great way to connect with them to create a relationship that is more personal and interactive. You’re too busy promoting yourself in tweets that you fail to take the time to respond to the people who’ve reached out to you. No one likes to be ignored, especially when they’re upset. Understanding how Twitter can transform customer relations for the better can be substantial for reducing costs and improving brand image. Good customer service is not just about quality of your product or service, but also about listening to the needs of your customers and being accessible to them. Twitter is a lightning-fast platform that can help sift through and solve problems quickly, so be sure to take advantage. The Resolution: Answer them. By using Twitter effectively, you can engage your customers, solve their problems, and build goodwill for your brand. Ever notice tweets in your feed from people you don’t follow? Those are promoted tweets. Some big brands have huge budgets and they want everyone to know they’re on Twitter, so they constantly ‘promote’ their own tweets. They show up in everyone’s newsfeed, all the time, and it’s annoying. Remember the kid in the neighborhood that always invited himself over? Don’t be that kid. 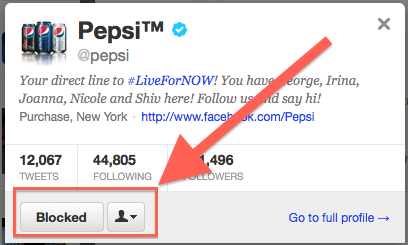 The Perpetrator: Recently, Pepsi launched a “Live For Now” campaign. In order to promote it, they have been sponsoring tweets that encourage you to drink Pepsi and live for now and now we all have to read their tweets. Somehow, they believe that drinking Pepsi will allow you to make the most of your life. Flawed logic aside, it’s annoying to have tweets from someone you don’t even follow show up constantly. Pepsi, please stop, #NOW. The Resolution: It’s okay to sponsor your some of your tweets, but save them for when big events are coming up or for an occasional reminder that you’re active on Twitter. Do you have a huge summer sale coming up? Or a movie coming out? Sponsored tweets can be a great way to engage a new audience or target a specific time of year in which you are most relevant. Quite often, you’ll see tweets that are littered with hashtags. This defeats the purpose of hashtags and makes these tweets feel like spam. Instead of using a technique that makes you easier to find, you allowed yourself to blend in with the crowd. The Perpetrator: Ohio State was really excited for their trip to the Final Four and in their excitement they hashtagged every topic in their tweet. A post that could have been useful and exciting now looks cluttered and feels like spam. The Resolution: A hashtag is meant to label a tweet so that it’s easily searchable. They facilitate and encourage conversations and should be used to highlight current events or topics so that others can join the conversation that’s taking place across Twitter. Use one or two hashtags at the end of tweets so that people can join in, but don’t go crazy. Which of these crimes do you find to be the most annoying? Leave us a comment and let us know! ← Welcome New Client, Cole Luxury Homes!